Barefoot and Carefree in the Kitchen! Have you ever noticed that when you go to a party where everyone is hanging out in the kitchen, those parties are the most fun? Well, Ina encourages guests to participate in the last minute food preparation. She puts on fun music and takes a more relaxed approach. Ina Garten decided she would rather cook because it was her true love and left her job as a budget analyst in the White House in 1978 to follow her dream of opening a specialty food store. 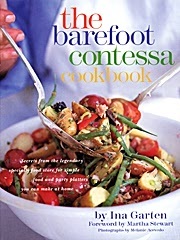 She now owns The Barefoot Contessa in East Hampton, N.Y. Over the past 23 years, this has become a culinary destination. It is now a 3,000 square foot market where 20 cooks prepare the food and another 20 people help customers in the store. The scent of rosemary and fresh French bread dances in the air. They prepare fresh salads and dinners according to what’s in season. In this book, you will find many of the good ideas and delicious foods that you can find in the store. After years of her customers asking for her recipes, she finally revealed some of her secrets in her first book: "The Barefoot Contessa Cookbook." I was very impressed with Ina's first book and gave her book as gifts to friends. This book is equally beautiful and James Merrell has done a wonderful job photographing all the food styled by Rori Spinelli. When you open this cookbook, you will feel like you are entering Ina Garten's world. The lush color picture of her home with the door left open is so wonderful and you feel like you could just walk inside and smell freshly baked chocolate chip cookies and take one right off the plate! "Food is not about impressing people," Ina Garten says. "It's about making them feel comfortable." So, where will you find Ina when she is hosting a party? You might find her whipping up Tropical Smoothies (page 39) and chatting with a friend in the kitchen. Someone might be helping to cook the scrambled eggs with asparagus (page 34) while another guest is cutting the Sour Cream Coffee Cake (page 37). These are all recipes in the Sunday Breakfast section. Was I impressed by her new cookbook? Yes. She has organized it so well and I love the party themes by season. Each recipe has a refreshing header and sometimes gives a variation for the recipe. The parties are divided into Spring, Summer, Autumn and Winter. They include a Sunday Breakfast, Pizza Party, Jewish Holiday, Academy Awards, Canoe Trip, Lunch in the Garden, Happy Birthday, Outdoor Grill, Football Party, Autumn Dinner, NOT Thanksgiving, Afternoon Tea, New Year's day, Snow Day, Valentine's Dinner and Fireside Dinner Parties. The Index is also well organized. The book design is superb and is all a cookbook author could wish for. Except for a few recipes, the entire recipe is on one page and you don't have to turn the page to read the directions in most cases. The instructions are not numbered. A space between various instructions gives you the idea that you are onto a new step, so they are easy to follow. Her recipes are not difficult to make. Most of the dishes can be prepared in advance. I also love her writing style. When you read her notes, you feel as if she is talking to you and you are sitting out on the deck with a glass of lemonade. Each party begins with a page telling you something interesting about a party. "I'll never forget the worst party I ever gave.".....pg. 33 Ina also shares her wisdom from years of catering and planning parties. Some of the things she writes in this book are just laugh out loud funny! She is so daring and has been catering parties professionally for more than twenty years. I mean, why not serve dinner in the study by the fireplace! I love her creativity. I can truly say that every recipe in this book looks just divine. I made the Chicken Chili recipe today, but in half the quantity. The ingredients included chicken breast that you bake while the onions, tomatoes and bell peppers simmer on the stove top. You just toss in the diced baked chicken and then in a few minutes, dinner is ready. You may use green bell peppers in place of the more expensive red and yellow bell peppers. I also used Mexican-style canned tomatoes since I had those on hand. You can also make the recipe even if you don't have a food processor. Just use a kitchen shears to cut up the tomatoes right in the cans. A 6-quart pot works well and someone might want to include more pan/pot sizes in a future printing, especially for new cooks. 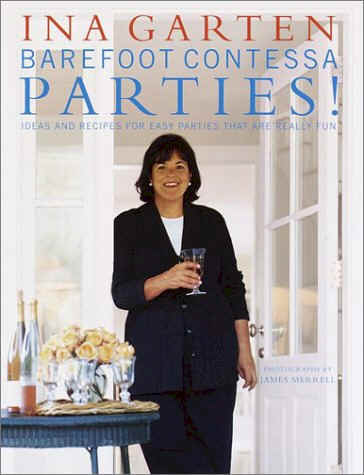 Now, I am thinking that to really have a real Barefoot Contessa Party, you might want to order her great coffee, the Contessa Blend. It was invented over twenty years ago and is a blend of coffee with cinnamon. While you are ordering the coffee from her site, I dare you to resist ordering some double-chocolate brownies. ...and, Ina writes them back! I was so impressed that she wrote to me to thank me for my comments about her first book and was even more delighted when she wrote to tell me of her second book. Now, that is class and I never will forget it. Ina's recipes are equally memorable!